Most MDX functions refer directly to levels or to their members. In MDX, however, levels belong to hierarchies, which belong to dimensions. Hierarchies and dimensions provide additional features beyond those provided by levels. Hierarchies are a natural and convenient way to organize data, particularly in space and time. For example, you can group cities into countries, and countries into regions. In such cases, it is useful to be able to query for the child cities of a given country, or to query for the parent postal region for a given country. A DeepSee cube defines the hierarchies among the levels, and MDX provides functions that enable you to work with the hierarchy, so that you can write such queries. In MDX, a dimension contains one or more hierarchies that specify how to categorize the records in a similar manner. There is no formal relationship between two different hierarchies or between the levels of one hierarchy and the levels of another hierarchy. The purpose of a dimension is to define the default behavior of its hierarchies and levels. All measures belong to a special dimension called Measures. This dimension implicitly includes a single hierarchy that has no name. This hierarchy does not include levels. The members of this hierarchy are the measures. Other than the Measures dimension, each dimension can also define a special, optional level, which appears in all the hierarchies of that level: the All level. If defined, this level contains one member, the All member, which corresponds to all records in the cube. For a given dimension, the actual name of the All member depends upon the cube definition. For example, All Patients is the All member for the AgeD dimension in the sample. In a given hierarchy, a level is the parent of the level that is listed after it. This means, for example, that ZIP is the parent of City. 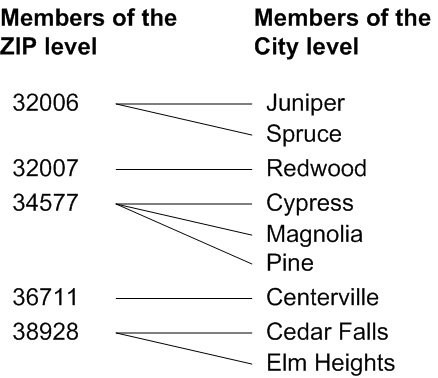 More specifically, each member of ZIP is the parent of one or more members of City. That is, it is shorthand to say that one level is the parent of another level; the actual relationship is between members, not between levels. This shorthand is in common use, because it is convenient, even though it is not precise. The distinguishing feature of a hierarchy is that any given child element is unique to its parent. This example is artificial because in reality there is a many-to-many relationship between ZIP codes and cities. In DeepSee MDX, if you omit the hierarchy name, the system assumes that you are referring to the first visible hierarchy in the given dimension. The first child of the previous member. The next sibling of the previous member. LASTCHILD returns the last child, if any. LASTSIBLING returns the last sibling, if any. The COUSIN function enables you to access a cousin, given a member at a higher level. To determine relative positions, DeepSee uses the default order of the members within the level, as determined by the cube definition. The DESCENDANTS function provides many options for accessing descendents within different parts of the hierarchy, but the preceding usage is the most common scenario. In a typical query, you iterate through a set of members, perhaps displaying each as a row. Sometimes you want to do something specific with each member in turn. To do so, you use the CURRENTMEMBER function, which accesses the member used in the current context.